Mary and I headed to the airport around 8am with a stop at Dunkin Donuts for bagel's, coffee and hot tea. I guess the shoppers were still recovering from black Friday since the roads were wide open and we made good time getting to the plane. I pulled through the gate and the plane was just inside the fence parked in front of the Red Eagle hangar, we tugged her up there so I could give the reiff heater system a try. The temps were hovering around thirty degrees overnight and I wanted to preheat and be ready to go without dragging the red dragon propane heater out to the ramp. I unplugged the new 100 foot extension cord, uncovered and stowed the nose plugs and completed the fuel sump. Once we were situated in the plane I turned on the battery switch to check the Cylinder head temps and oil temp prior to start up. The Reiff system had the CHT's at 205 degrees and the oil temp was sitting in the yellow, we were ready to roll. I called for my clearance after start up and plugged in the route for the Garmin 530 and 496. 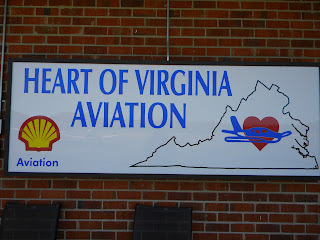 I was cleared KOFP, Hanover county, the route was runway heading, radar vectors to Smyrna ENO, V16, PXT, TAPPA, KOFP. 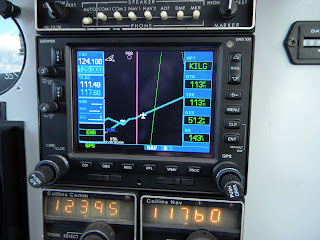 Altitude 2000 expect 6000 in ten minutes, approach is 119.75 and squawk 1157. I taxied out to runway two seven and called for my release. We were ready to go with one change from the tower, direct Smyrna ENO and cleared to 3000. 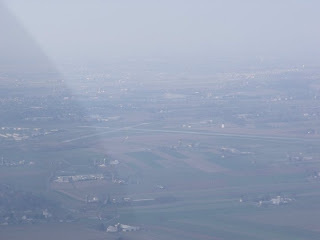 I was soon pointing down the runway calling airspeed alive gauges green, our adventure was about to begin. I was quickly handed off to Philly and cleared to 6000 then handed off to Dover. Dover amended the clearance, direct CHOPS, which provided a short cut to our next way point. 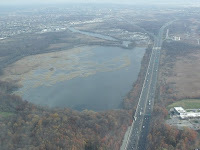 I checked in with each approach control as I was handed off, patuxent then potomac. 08Romeo was making good time as we crossed over each checkpoint. 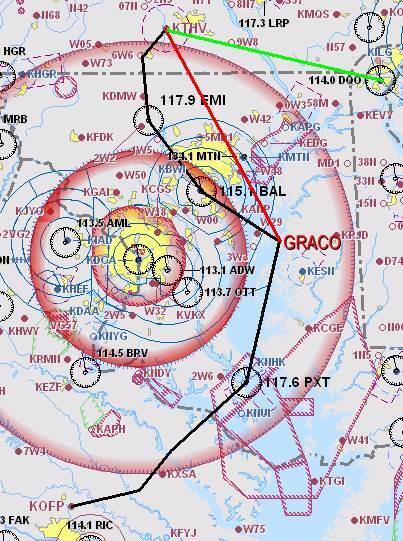 I received a reroute from Potomac to fly direct RIC (Richmond VOR) then to Hanover. Seemed like a back track but I figured when I got handed off I would get another change direct Hanover. 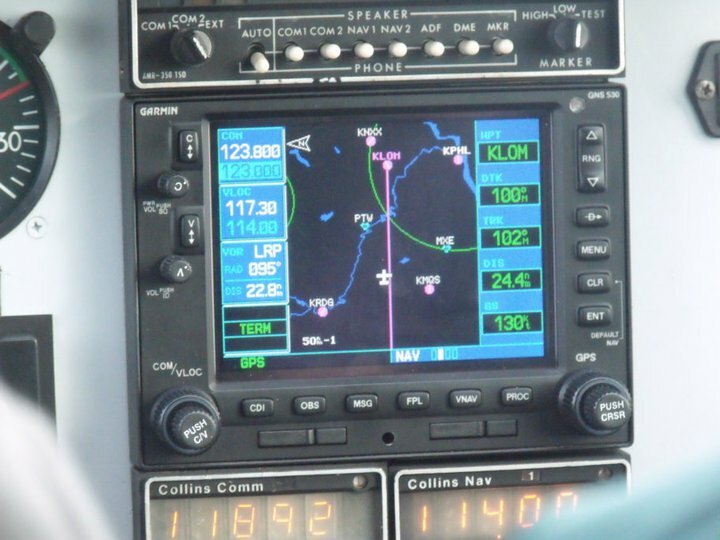 I descended to 2000 feet and canceled the Instrument flight plan with the field now in sight and wx noted. There were two aircraft in the pattern but everyone played nice and we worked our way in, I was number three to land. A very nice landing and short taxi to the Heart of Aviation FBO. I took on fuel to bring our load to 46 gallons which would get me to York and home to Wilmington. Debbie pulled in and brought both dogs into the FBO. 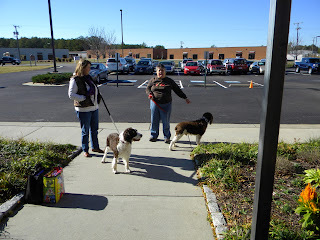 Arleigh and Charleston were ready to go and enjoyed the fuss everyone made over them. I sumped the fuel while the ladies walked the dogs for a last potty stop then we loaded up. Both dogs settled right in after some crying as they tried to figure why Debbie was leaving them with us. I locked the baggage door and then climbed aboard. 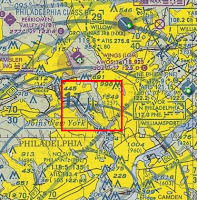 ﻿﻿﻿﻿I had filed a flight plan for York, PA and tried to pick up clearance with the clearance/delivery frequency noted but had no luck. I called the 1-888 FAA CD number and got everything squared away. The plan was to back track our flight path from our flight down but make a left turn to the north west and head direct Baltimore then York. After completing the run up we launched for leg 2 of the journey. Both dogs were sleeping and Mary was also in dreamland before we got to altitude. Leg 2 started off with good speeds but once turned NW the 45 knt head wind limited my ground speeds to 70-90 knots. 08Romeo chugged along at 7000 and skimmed the cloud tops. 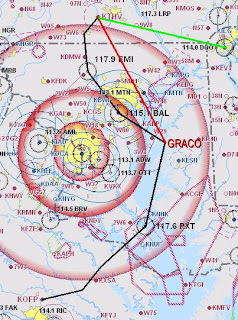 My route was amended to direct York once crossing GRACO, no fly over Baltimore's BWI. 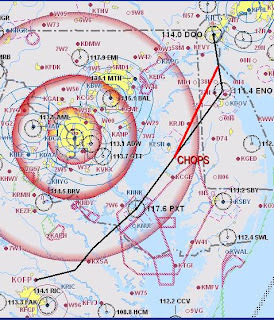 Once clear of the BWI class Bravo I did request 4000, with the plan to descend through the layer and do a visual approach into York. The plan worked fine and we went through the soup, very cool. I was wondering how rusty I would be but it was easy peazy. 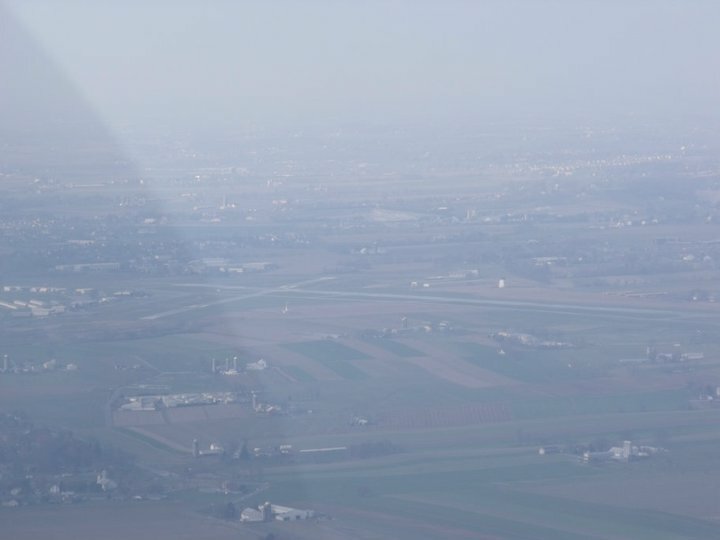 Pitot heat on, my descent had started. I found myself calling out on course wings level descending 500 ft/min. The verbal scan helped me focus and we soon popped out beneath the overcast layer. I had some concerns about ice since the temps were cold enough and there were reports of aircraft going through the same layer or traveling in it and picking up ice. ﻿I reported York in sight and had the current wx. The winds were really gusty as I made my way to runway three five. I added approach flaps and the second notch as I was in the flair. I worked the throttle and listened to the moan of the stall horn as I planted one main then the next for a smooth landing. 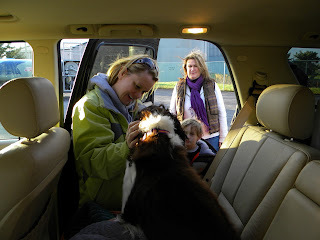 Mary was impressed...heck, so was I. I taxied in and secured the plane so we could let our furry passengers take a break and stretch their legs. Mary and I, along with Arleigh and Charleston, sat in the terminal as we awaited Tim and Linda's arrival, Arleighs new family. Tim and Linda walked in and they hit it off with Arleigh. Both new parents participate in Golden Retriever rescue so they knew the drill. Arleigh seemed happy and trotted off with Tim, heading for their car. 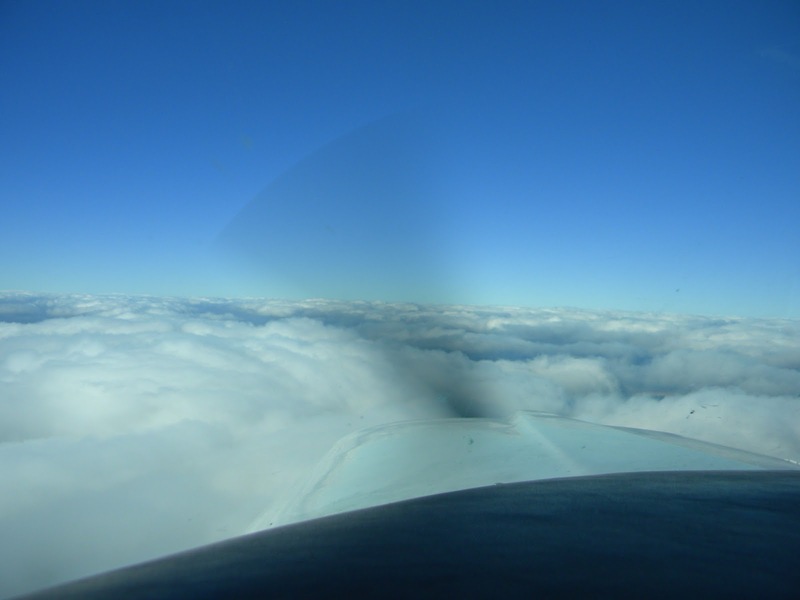 ﻿﻿﻿I taxied out ahead of a twin engine that was waiting for a release and completed my run up. I announced my departure and climbed out of York on leg 3 of the journey. I had a stiff crosswind and I needed to work to keep on center for the take off roll then rode the crab angle climbing out. 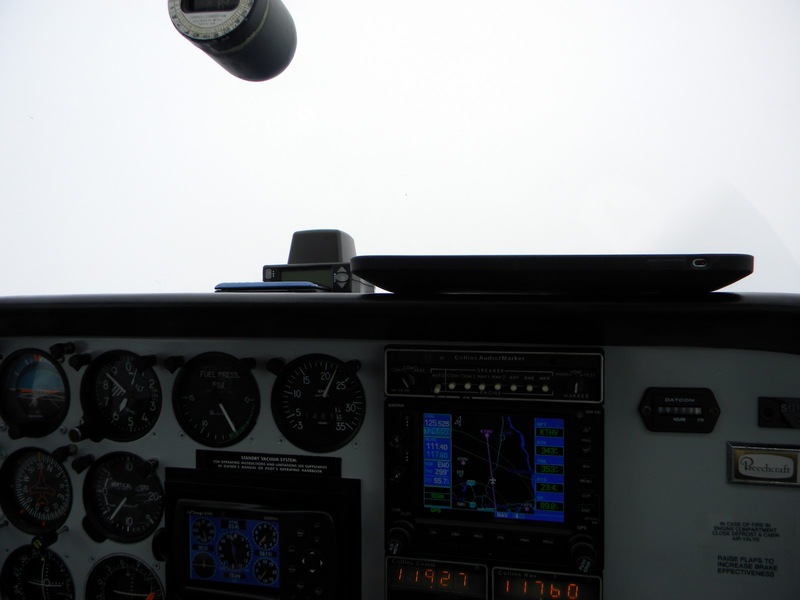 I turned cross wind and down wind then exited the area making a last call to advise our position and heading. Charleston was curled up and soon fast asleep. It was really bumpy but the tail wind provided a fast ride home. I was looking at 145+ ground speeds at 2400 rpm breaking 150 kts at 2500 rpm. 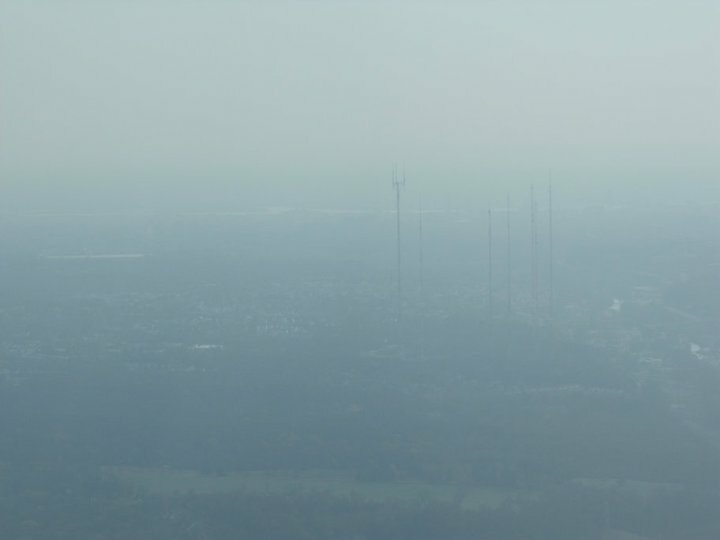 I monitored Harrisburg approach then Philly before contacting the Wilmington tower. I advised Wilmington I was 13 west, inbound for a full stop with the current ATIS and my altitude. I was directed to enter right down wind two seven, report midfield. 08Romeo entered the pattern riding the proverbial rodeo horse. Winds were gusty and it made for an interesting turn to final that required a pretty good bank angle. With a steeper bank I needed to keep some extra speed in and when rolled out and aligned on center I was working to get slowed down. Approach flaps set and working the winds I made my way to the numbers. I keep my speed on the high side crossing the fence and working the flair adding the second notch of flaps and being patient. I ride it out and set down on center and smooth, we're home. The taxi to the ramp requires rudder work and full aileron to try and keep on center. I taxi through the ramp and turn away from my tie down to align for my push back. Once shut down Mary and I both sit in the warm plane and pack up. My ears are ringing, I have the chills and I am sounding like froggy from our gang. It's good to be home. ﻿Mary climbs out first so she can bring the SUV to the plane. 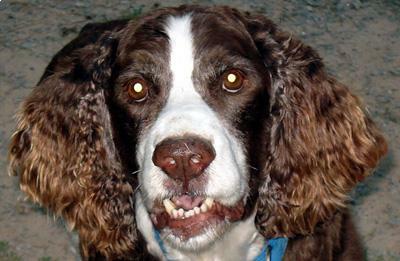 Charleston wakes when he feels the cold air rush in the open cabin door then wimpers as he watches Mary walk away. I told him it was ok, she is coming back. Charleston set his head between the front seats and let me scratch him, content with the comfort I was providing. First order was to get our passenger in the SUV and comfortable. Mary and I cleaned out the plane but I was feeling to sick to try and cover in the wind. I didn't even note the flight time numbers in my log, I just wanted to get in the warm SUV. 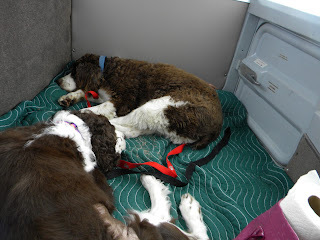 Charleston fell asleep in the backseat as Mary and Bruce (Charleston's new family)made their way to Red Eagle. We swapped a few text messages and before long they were pulling in the parking lot. 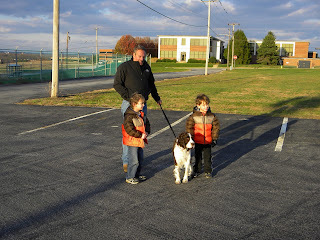 Bruce took Charlie out to the grass area and two of their triplet boys joined them. What a nice family, they were really excited to have Charleston back in their life. 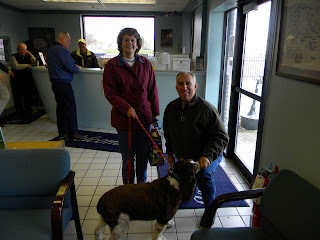 Mary and Bruce found Charlie in a vineland, NJ animal shelter and fostered him for Debbie and the MAESSR. After sending him to Debbie in Virginia for surgery he was now returning to his forever home. Mary and I completed our first rescue mission, it felt great. The look on the boys faces and their parents along with the love that Linda and Tim showed was priceless, there are good people in this world. 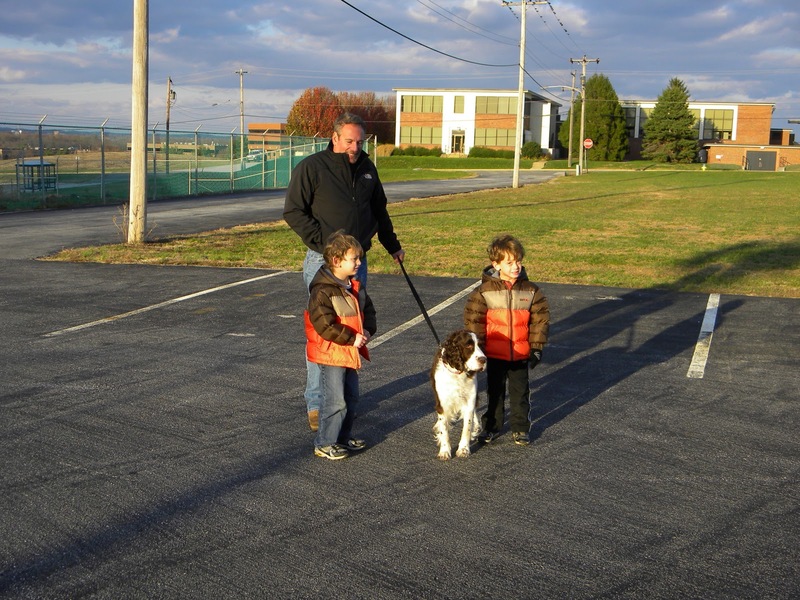 We were happy to meet both families and provide transportation for two very special furry kids. Arleigh and Charleston, you were our first rescue flight. It was a great experience and I'm sure a memory that will be hard to beat. We are looking forward to our next mission! 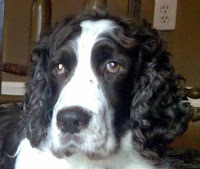 Mary and I have been talking about providing flight assistance for dog/cat rescues. We had a chance to do a flight over a week ago but got bumped by a pilot who was in the area on business and happened to be flying home to the area the dog needed to go, what timing for that lucky pup. 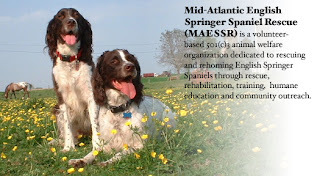 After posting the miss on our first flight, on facebook, I got a message from my friend Bob Ciotti who has flown rescue for the Mid-Atlantic English Springer Spaniel Rescue. Bob hooked me up with Debbie (MAESSR President) and I think we are on board with an organization that fits our mission range. 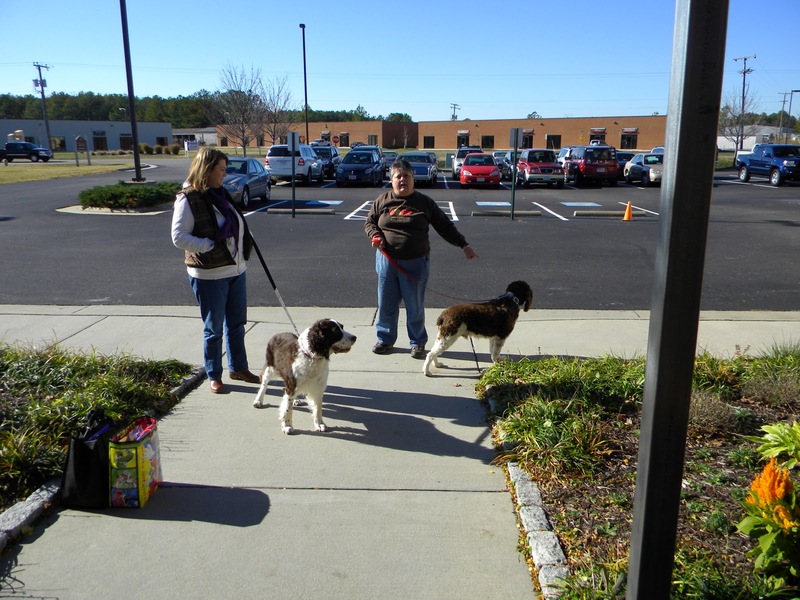 ﻿two new furry ﻿﻿passengers,Arleigh and Charleston, for a north bound trip to York,Pennsylvania to drop off Arleigh with his new forever family. The last leg will bring bring Charleston home to Wilmington, with Mary and I, to meet his new forever family. ﻿﻿ We are both very excited about the opportunity to help out. We will have plenty of pictures to post!!! did cancel due to the forecast winds but I think the haze/muck was worse then the wind. I asked Vince if he wanted to attend and he agreed to meet me at the plane around 10AM. I had ordered fuel to make 20 gallons a side. I figured a twenty minute trip to Wings, KLOM to pick up Dave and then thirty to Lancaster, KLNS for the meet up. Weight and balance allowed 35 gallons for our combined weight and at start up I had 37 left on board. With the taxi out and run up burn @1.3 gallons we would be perfect for w&b. We climbed out of Wings minding the "no turns" until 1,300 feet noise abatement and then proceeded on course. Dave had a chance to look over the iPad since he is thinking about making the purchase and Vince was back seat clicking off pictures. Dave did fly for a bit and made a few turns to get the feel of the plane. Mind you Dave owned and flew a gorgeous V tail Bonanza (my dream plane) but recently sold it for a fun toy the DeHavilland DHC 1 Chipmunk. We didn't spot Lancaster until,maybe eight miles out and received clearance to land runway three one. I guess maybe eight of us showed up for lunch and we fit in one of the side rooms gathered around a large dining room type table, more of a conference room table. Service and food were very good and the conversation moving quickly in many directions. As a group we decided to invade the pilot shop, most walked, I taxied 08Romeo down taxiway A and on to their ramp. I did pick up some lubricating spray to keep in the plane and some spare double A batteries for the cleaning kit bag to have for an emergency. We all said our goodbyes and headed out. I was first off since i had taxied most of the way down the parallel taxiway to runway three one. I picked up the ATIS and called ground then turned into the wind for my run up. Everything looked good and once cleared we launched off three one, right turn on course approved. I flew for a bit then turned it over to Dave. 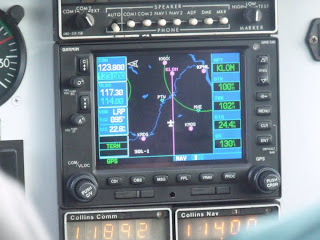 With a sweet tail wind of twenty knots we saw ground speeds of 132 knots. It was a quick trip back to Wings. It was a short stop for Dave to climb out and Vince to climb up front. With that complete we were ready to taxi out. Clear of traffic I announced and got 08Romeo rolling down the runway. It was all haze and muck on the way home with not much to look at. Philly approach was very quiet too. 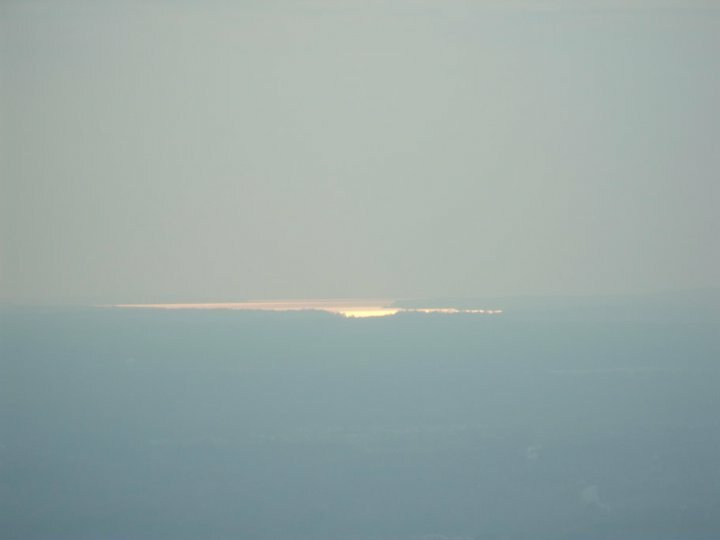 One nice view was the sun reflecting off the Chesapeake Bay offering up a warm red glow, that was the highlight coming home. My call to Wilmington had me entering right traffic for two seven. A super smooth landing and roll out for taxiway M and we are home. A fun day with good friends! I turned in a leave slip so I could join Mike B in taking Jeff's Archer, 93Zulu to Cecil Aero for an oil change and compression check required for his ECI Cylinders. Mike and I planned to meet up at Wilmington on the Red Eagle ramp around 6:30AM. I was up and on the road but had to turn back to update the Jepesen data card. I guess I rolled in a few minutes late but we both knocked out the pre-flight in the morning chill. 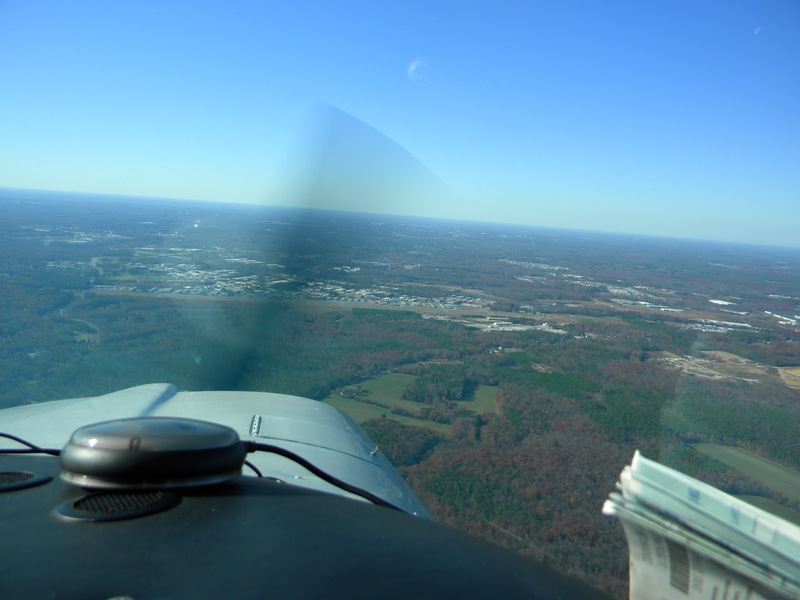 I flew the first leg to Delaware Airpark, a short hop on a beautiful morning. 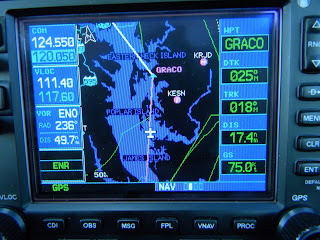 I shot the RNAV GPS 27 approach and was doing pretty good right up until Mike said to look up. Yikes! I'm high and almost at the airport. I overflew the airport and entered the pattern with a pretty good landing. Once taxied clear Mike pointed out that I did not monitor my speed close enough on the approach I was over 100 knots and this approach is close coupled. The distance between fixes is only 2.5 miles. I secured 08Romeo and Mike started the pre-flight for 93Zulu. The Archer needed fuel so we took care of that and then pushed back to clear the pumps for one of the flight school planes needing a drink. Last pit stops completed we started up and taxied for departure. 93Zulu climbed out in the chilly morning air possibly looking forward to stretching her legs with owner Jeff but instead heading for the short hop to 58M for some fresh oil and a filter. Roger and Frank jumped right on the compression checks then got the oil draining. Jeff wanted a mid stream sample to send off so that was taken care of too. Compression checks looked great 76/78's across and the fresh Phillips XC 20w50 golden honey was flowing. A start up followed by a leak check was completed and 93Zulu was ready to button up. Jeff wanted a check of the nose gear strut and that was also addressed as good to go. Mike and I saddled up for a breakfast hop to Kay's at Cambridge airport. Mike picked a hole and climbed above the scattered cloud layer at 4,500 but as we headed south we needed to climb to 6,500 to remain clear. We gave some thought to getting a pop up to descend through for Cambridge but the garmin data card had just expired yesterday. No problem, picked a big hole and descended through maintaining VFR. I know, we could have still asked for the pop up and filed as /A (DME and Transponder with Mode C), but the layer was scattered and really not worth the hassle with Potomac approach. Mike made a nice landing and a smooth taxi to the ramp. There was a citation, cirrus and a Cessna straight tail tied down and we found a spot to join the crowd. The restaurant was busy as usual but we were seated quickly. Lunch was great and the large jar of sweet tea hit the spot. Mike took on some additional fuel and squared up with the attendant while i strolled outside. A really sharp looking Ercoupe had pulled up and I noticed he had landing lights on his main gear. I wandered over and asked if his name was Bill, thinking he was the Baltimore Bill that I had seen on the Purple Board for pilots forums, he was not. Great guy to chat with and he didn't mind me taking a few pictures of his landing lights. 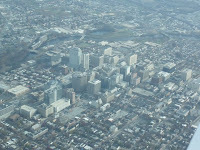 Mike and I once again saddled up for home with a slight detour to shoot an approach into Georgetown, KGED. 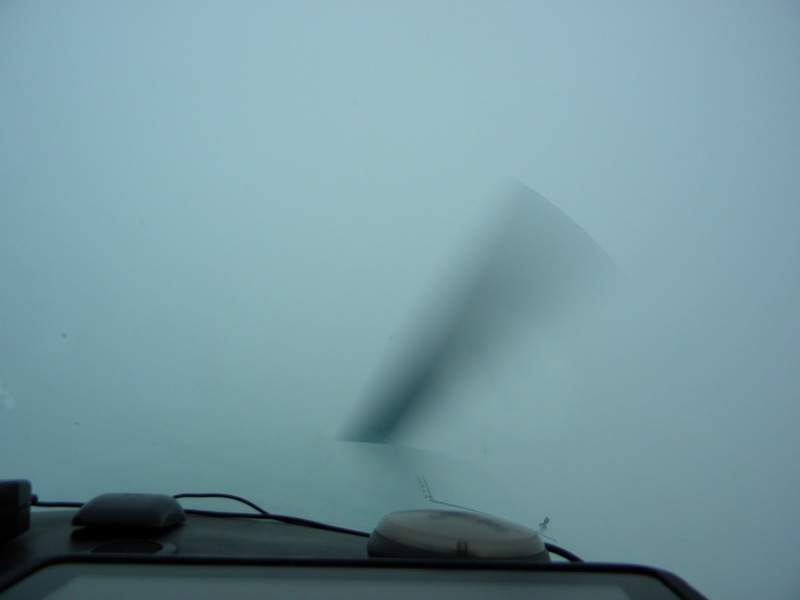 I was safety pilot and eyes outside looking for traffic as Mike flew the gauges. I made the radio calls and Mike got us to the runway, another very nice landing. It was a quick turn with calm winds so we just re-entered the runway, now departing on two two. 93Zulu climbed out and we pointed towards the Delaware coast along the Bay. 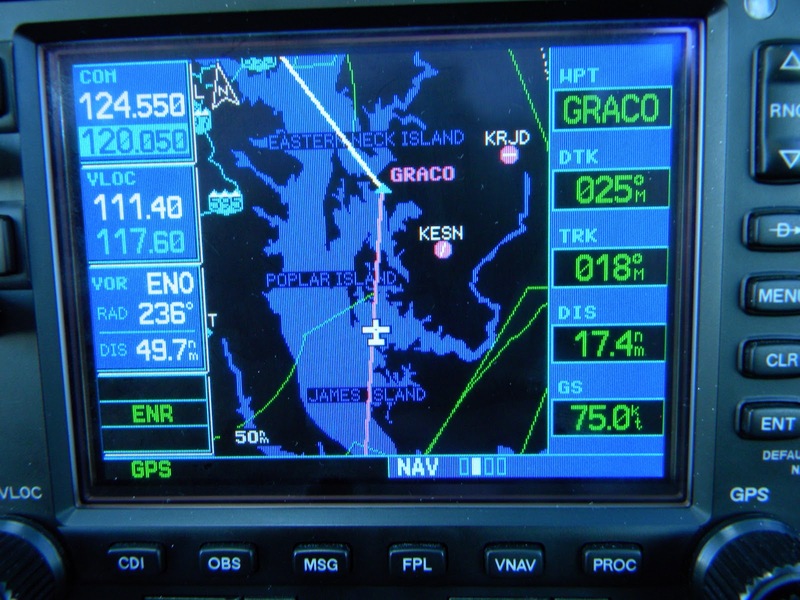 I picked up flight following with Dover approach and Mike shot the RNAV GPS 27 approach into 33N, he was on the money. With 93Zulu secured we walked across the ramp to 08Romeo. I got to chat with the Airport manager and co-worker Ben C for a bit the we climbed aboard for the hop north. Mike took this leg back to Wilmington since he wanted to shoot the ILS RWY 1 that is back online now that the EMAS project is complete. I did the radio work as we headed north and Wilmington was busy. 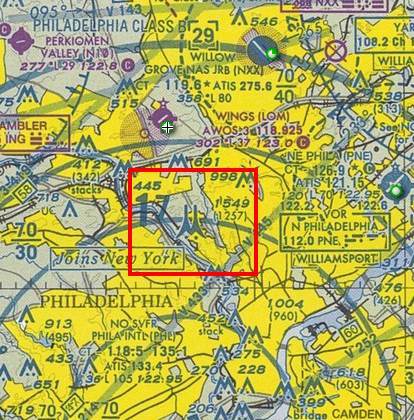 Switching over to Philly approach to see if we could get vectors for the ILS was useless as they were really busy. 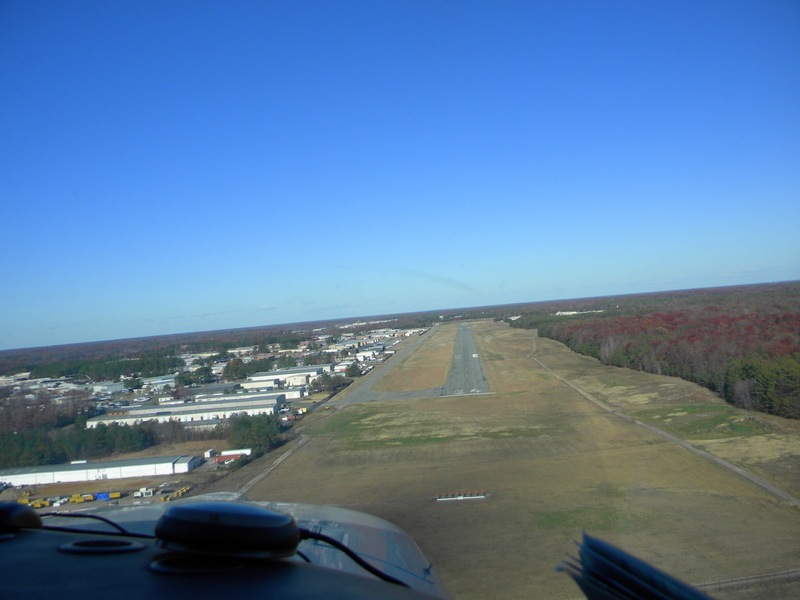 Back to Wilmington's tower and advise position and intentions for a full stop landing. I didn't recognize the controller on today, must be a new guy because he was a mess. He was confusing airplanes and tail numbers really bad and had called us out as traffic to ourselves at one point. You can listen and decide. Our initial call is around 4:50, at 6:40 he calls out another sundowner as traffic to us in the only sundowner in the area. At 7:50 he clears us for at/or above 1000 then comes back correcting us (a bit excited) to 1500. Around 9:40 or so we are cleared to land and Mike is now on the radio, he is so much calmer than I am. We are called out as Cessna something, more confusion. Then once landing, around 11:35, he gives instruction for Cessna right turn on Delta. We landed a bit long to help keep the flow going and have to much speed for taxiway delta, we exit on taxiway Kilo. It was crazy. We walked up to the pilot of the Archer behind us, who also is located on the red eagle ramp, and chatted with him once we had secured 08Romeo. He understood and mentioned how many times the tower confused his aircraft and routed him multiple directions at one time. There was around 6,000 feet of runway behind us as we cleared runway one and yet he made the Archer go around. This sound track is going into the files. 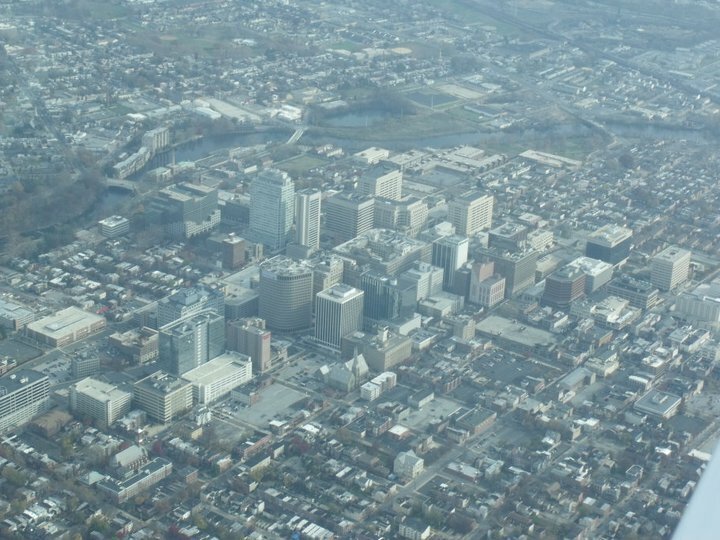 Despite the Wilmington Tower mess it was a great day to fly! 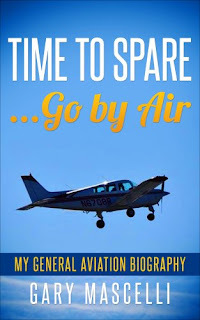 I have been flying for 4 1/2 years with multiple trips south along the Delmarva peninsula on our many trips to the Carolina's, Williamsburg and other stops along the way. 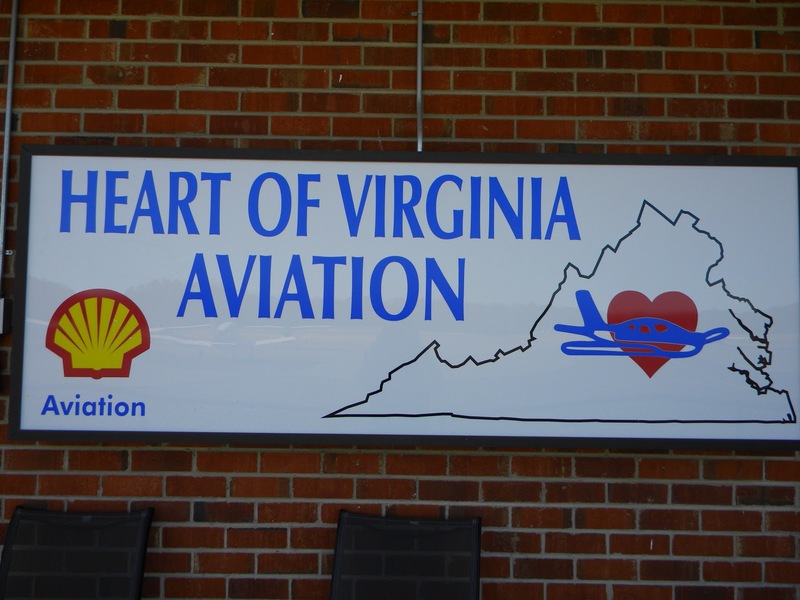 On each and every one of those flights as we pass by KMFV Accomack Airport, I mutter the same phrase, we really have to stop there and check it out. Well today was the day, no trip south other than the primary target of Melfa, VA and the airport. I headed to the airport early so I could install the taxi lamp retaining ring and test the system. Everything went very smooth and I only need to check it out at night to make the final comparison. Once the light work was completed I did my pre-flight and ordered fuel. Mike B is under the wx so he is a no-go for today's flight. I went through my list of co-workers, some were sick, some didn’t answer and others were doing the honey do thing. No problem, I took on 22 gallons and saddled up for Accomack. No flight plan in the system, it’s to darn nice to follow anyone but my own vision for today. I climbed out of Wilmington enjoying the new found rate of climb in 08Romeo. Right turn on course and I am pointing south. I monitor Dover approach and notice it’s busy with the “wings” group holly run to Tangier. I decided it would be best to have the extra set of eyes with me and call up for following. Visibility was the best I’ve seen in months! 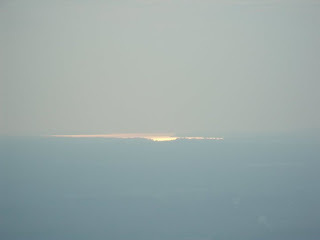 It was a clear view down the Delaware bay and an easy view down the Chesapeake. My flight plan on the iPad had me just west of Dover and Georgetown and my path took me directly over the Salisbury airport/vor before turning on course direct KMFV, Accomack. Pictured is the town of Pocomoke City, MD just north of the Maryland Virginia state line. You can see the Pocomoke River just beyond the thick tree line. Accomack was just a short distance so I canceled flight following with Patuxent who seemed to have his hands full with the gaggle of planes heading to Cambridge, Crisfield and Tangier for the annual Holly run. I made my call about 15 north with my intentions for a full stop. As I entered the pattern from a 3 mile 45* I traded info with a Cessna turning base then final. I was number two and on the ground with a nice short field landing. I secured 08Romeo and wandered into the terminal. This place is really nice looking and the ramp area had a good many aircraft tied down, planes that fly, no ramp trash here. Once inside I checked out the pilot lounge and flight planning room along with the bulletin board. There was a Stinson for sale that looked pretty clean and low time. I took a potty break then went to the soda machine for a bottle of water for my ride home. I chatted with the seasoned gent working the counter and got some info on the place. Enterprise will leave a rental if you call ahead. Two restaurants will come and pick you up if you call, their menus are on the main desk with the appropriate phone numbers. We chatted for a bit more about all the traffic today with the holly run and the perfect wx for flying. With that, I decided it was time for me to get moving. I said my goodbyes and thanked him for the chat as I eyed the rockers out on the long front porch overlooking the ramp…..Hmmmm what a nice day to sit a spell and enjoy the peace and quiet. Well, as sweet as those rockers look I really should be moving along. I saddle up for the ride north planning a quick route on my vfr chart on the iPad. Love the point and drag feature with the immediate plan numbers updating. I decide to head north east towards Wallops Island then north to Ocean City Maryland. 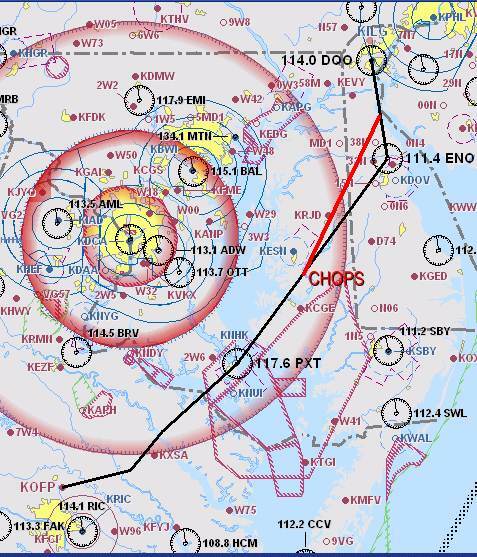 Wallops airspace is class Delta and I need to be at least 2500 feet. I pass above at 3500 and flip over to the tower and advise passing overhead SW to NE. I am advised to report clear of the area, I acknowledge. When I updated my position, now clear of the airspace, the tower controller asked me for my tail number again and model type then said have a fun flight. Odd, but yet he seemed friendly enough. 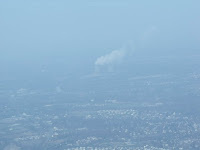 I had Ocean City MD in view and advised Unicom I was passing over the field and my altitude. I made a turn to follow the coast a bit then turned north for the leg home. What a great view, and no banner planes to deal with in the off season. I turned for home and got a nice shot of the Assawoman bay off my right side. Once again I passed on flight following instead singing with the oldies and enjoying my view. Dover was busy and I did monitor on my way north. I passed east of the Dover AFB and crossed the north end of the Delaware bay. 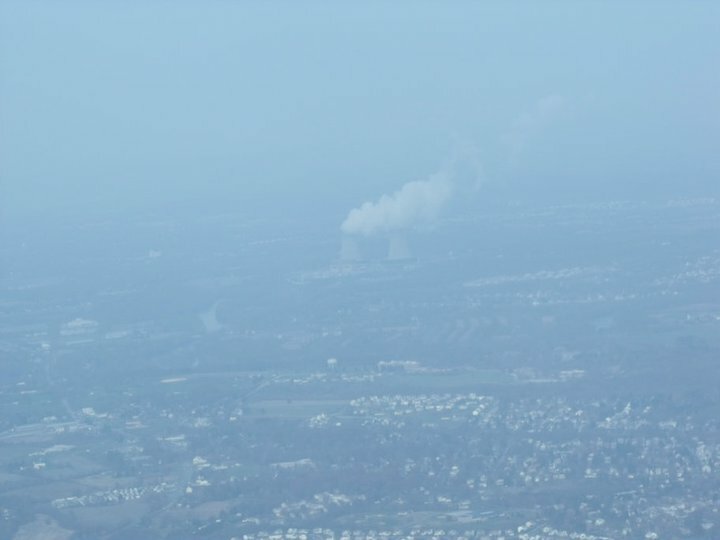 My flight path took me directly over the Salem nuke plant cooling tower and up the Delaware river. I made my call to the Wilmington tower and was directed to make a straight in for runway one. There was a Mooney inbound for a full stop but he was a mile or so behind and coming from the south east, the jersey side of the river. I took the time to plug in vectors for the ILS runway one approach since it’s back online now that the EMAS job is completed. The tower asked for best forward speed and cleared me to land. I powered back up and nosed over for a 120 knot run to the numbers. Good practice for the chance I may go to a busy airport with jet traffic and they ask me to do the same. Ok, running through the process….no flaps till crossing the fence, I can land long since I am going to far end of the airport to my ramp area, the tower approves landing long. I am crossing the EMAS as I pull the power, add a bit of a slip, hold it off, in the white arc and add a notch of flaps. Slowing down, holding it off adding the second notch clear of runway three two so I can touch down. The mooney was cleared for three two. I squeak it in and roll out retracting the flaps and adding brake pressure just enough to slow me down for the taxiway Kilo turn off. That was fun! Great day flying, enjoying the view and the freedom flight provides.